When it comes to demographic targeting, Facebook is leaving the major search and social networks in its wake. With the Google Display Network offering a mix of gender and age within its contextual advertising environment, and LinkedIn targeting ads by profile data, Facebook still reigns supreme. So the question is why? Enter the concept of the social synonym. While publishers are deploying some pretty cool behavioural targeting, Facebook is widening the goal posts in its reach and sophistication. Reach doesn’t just refer to the audiences you can target, but also the fact that media agencies can be dis-intermediated paving the way for direct advertisers. At this point in time, Facebook advertising is not a threat to Google AdWords which offers a supremely clever quality based keyword bidding system (far more sophisticated than the competition at Binghoo!). However, Yahoo has admitted that Facebook is a bigger rival for them than Google, and its only a matter of time when Facebook advertising will be on a level playing field with Google. When it comes to demographic targeting, Facebook offers advertisers a tastier selection of demographic and social filters that can improve ROI by exposing ads only to the most relevant audience. 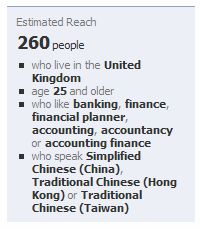 I spent that last hour having some fun testing Facebook’s demographic targeting. 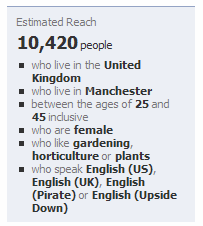 If I’m an etailer targeting women in Manchester (UK) who love gardening, I have a healthy target group who will click on my ads. If I’m a recruiter looking for a Chinese speaking accountant or financial officer, my target group size may be small, but at least I wont receive unwanted clicks. In the world of pay-per-click, small is beautiful. If I’m targeting journalists who happen to work at the BBC (our SEO copywriting course springs to mind! 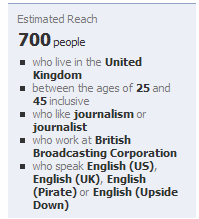 ), I can clearly define my demographic by company as well as interest. The concept of social synonyms and Facebook’s demographic targeting was neatly summed up by Aimclear’s charismatic chief exec Marty Weintraub who I had the privilege of meeting last year. So if I’m Mothercare, on Google AdWords I may well be bidding for “kids clothes” or similar, but on Facebook, I’ll target all women whose likes include “I love my daughter” – a social synonym. If my Facebook like happens to include dolphin-friendly tuna, I’ll be targeted by Body Shop or similar. Again, the concept of the social synonym. End of the traditional advertising model? The venerated CPM display advertising model that targets audiences by content, geography, context or behaviour is not going to disappear in the foreseeable future. But advertisers cannot ignore the rise of social advertising. Facebook is allowing advertisers to choose another channel that doesn’t involve traditional display ad targeting, nor does it involve keyword bidding seen within search networks. It is offering a more subtle approach to targeting, that has not only shifted the goal posts, but has done so within the fastest growing social media environment we have seen to date.